Most of the participating NYC BBQ talent assembled at the end of the night at Sunday’s NYCWFF Backyard BBQ. The event, hosted by Hometown Bar-B-Que owner Billy Durney and meat master Pat LaFrieda, attracted hundreds of people and featured more than 30 vendors. Local BBQ staples like Blue Smoke, Dinosaur Bar-B-Que, Handsome Devil, Hill Country, Kimchi Smoke, Mable's, Mighty Quinn's, Pig Beach, and Virgil's were all present and serving delicious bites. 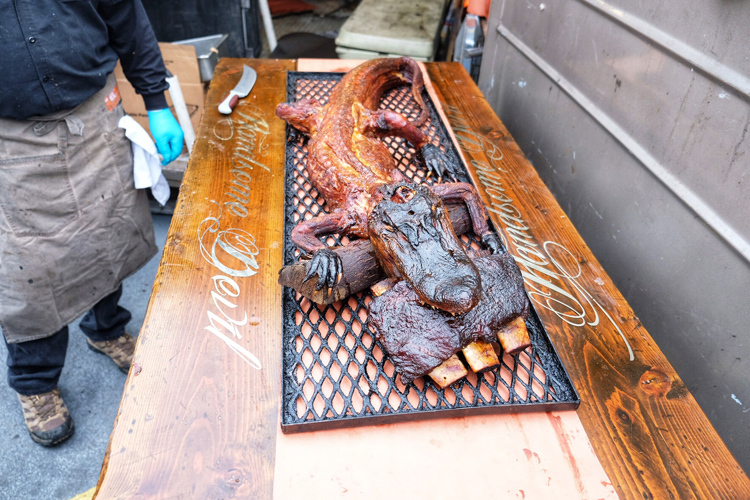 Handsome Devil's whole hog and whole smoked alligator (see below) turned a lot of heads. The Backyard BBQ also featured talented up-and-comers like Tribeca's Holy Ground, Brooklyn's Carnal, Staten Island's Corner House BBQ, and Astoria's Salt & Bone. Holy Ground served up a tasty pulled pork sandwich, the Carnal crew handed out perfect beef rib pieces topped with bone marrow, Corner House BBQ served up a crazy "24K gold bacon," and Salt & Bone handed out whole hog sandwiches. I can't wait to see what these operations do next. At the end of the evening, the People’s Choice Award went to Nick’s Lobster House for its grilled octopus. 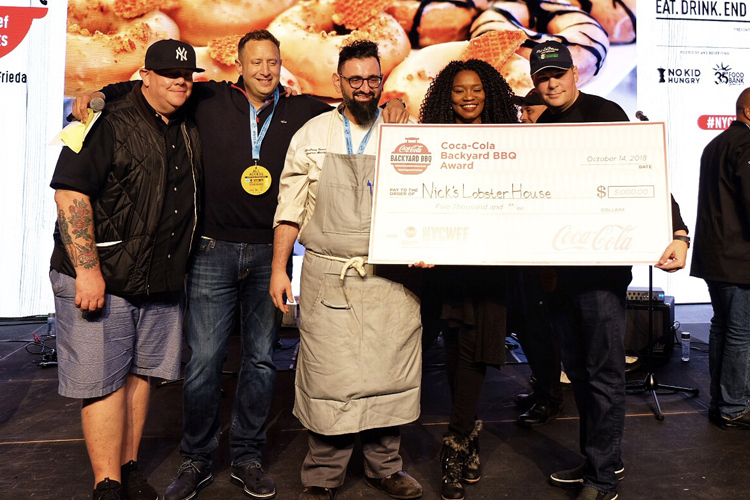 As this was a BBQ event, that choice was a little bewildering, but congrats are in order for Dimitrios Karousis and the whole Nick’s Lobster team. In 2nd place was Jean-Paul Bourgeois from Blue Smoke with his smoked pork steak and mac 'n' cheese. And in the 3rd place was Matt Abdoo from Pig Beach with "Jeff's Smoked Brisket Sandwich," (see below) which was dedicated to former Pig Beach pitmaster Jeff Michner, who passed away unexpectedly earlier this year. 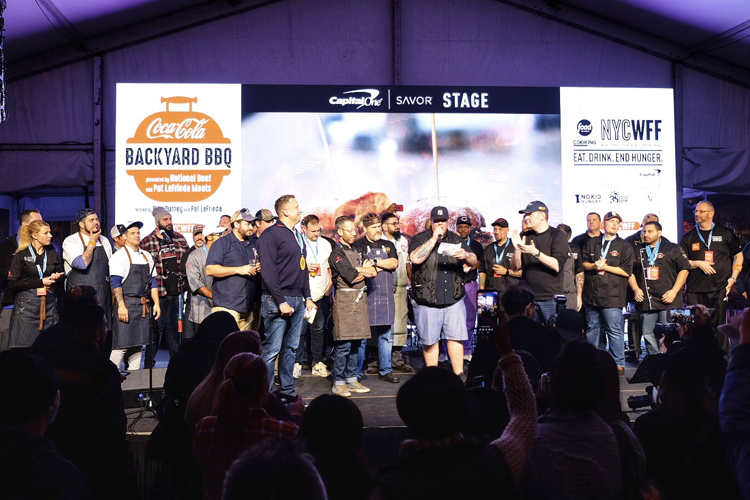 Both Blue Smoke and Pig Beach deserve recognition for their substantial contributions to our BBQ scene, and I was glad to see them up honored on stage too. However, while this event served as a showcase of all the incredible talent we have, the fact that a single ticket to the three-hour event cost $175 for one adult is frustrating. The Backyard BBQ is one of the best ways to try most of NYC's best BBQ offerings in one place, but it's simply too expensive and ensures many working-class and middle-class folks can't take part. Perhaps there’s a way to both show off the best BBQ we have while also being accessible. There is certainly an appetite for an event that costs less than $100 and showcases all of NYC’s best BBQ. Let's make that happen, New York. John Stage, CEO and co-founder of Dinosaur Bar-B-Que, sat down with MassLive this week to discuss the beginnings of Dinosaur in Syracuse, how he ranks the best BBQ, and what signals inauthentic barbecue when you’re visiting a new joint. The incredible folks at Operation BBQ Relief are now serving meals down in Tallahassee and Panama City, Florida, following the devastation of Hurricane Michael. Volunteers (including some from the NYC metro area) have served more than 217,000 meals since the beginning of the deployment. Donate here to help their efforts. October 22: For one night only, Westchester's Crafty Cue and The Bronx Beer Hall are teaming up for a BBQ & craft beer pairing event. A $25 ticket at the door (or $20 in advance) will get you one entree, two sides, and a pint. Buy tickets here. October 27: Barbecue is coming to big screen on Saturday, October 27 during The Food Film Festival at AMC Empire 25 in Manhattan. “Fire and Smoke: Texas BBQ and Beyond” will feature six documentaries about barbecue and guests will get to taste BBQ from The Original Black's BBQ (Texas), Melt BBQ (Paris), Izzy's Smokehouse (Brooklyn), Kimchi Smoke (New Jersey), Gentle Giant Brewing (Pearl River), Randall’s Barbecue (New York), and more during the films. Use the promo code “NYCBBQ10” for 10% off tickets to this or any other Food Film Festival event. Buy tickets here. November 2 & 3: The groundbreaking Food Loves Tech event, now in its third year, will take place in Industry City, Brooklyn. General admission tickets run $75, and it will show off how technology shapes and changes the way we cultivate and consume food. Food Loves Tech combines installations, tastings, panels, and dining experiences to explore and celebrate the future of food. Buy tickets here. November 10: Jimmy Carbone of Jimmy's No. 43 fame will be throwing his annual Ciderfeast event at Biba in Williamsburg. This all-inclusive event runs $45 per ticket and will feature more than 15 cider brands, plus a wide selection of cheese, roasted pork, vegetarian dishes, and more bites. Buy tickets here.